AEC was awarded this project following and invitation to bid from the client based on our past performance and reputation for successfully performing fuel-related projects. 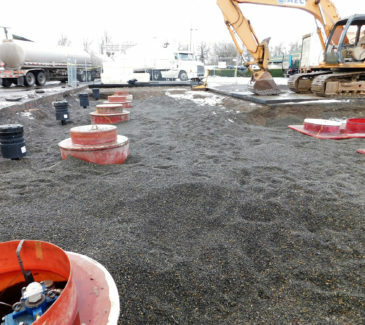 Our initial scope of work included a complete UST tank upgrade, the disposal of soil associated with excavation work, installation of new fuel dispensers and startup activities, new concrete slabs and islands, and all associated electrical work. 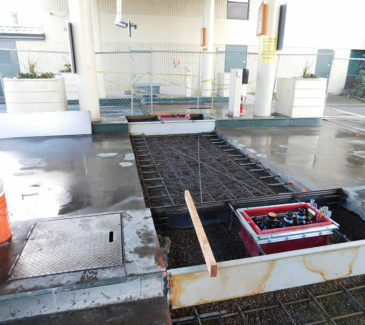 Following project award, however, the scope of work was modified to incorporate a B99 biodiesel tank and related piping. Additionally, crews discovered roughly 186 tons of petroleum contaminated soil (PCS). All PCS material is loaded and transported for disposal at the Waste Management landfill in Hillsboro, OR. Phase 1 began with the setup of site security fencing and the electrical isolation of the B99 tank. The tank was cleaned and then modified by drilling 6” holes in the inner, 7,000 gallon tank, in order to incorporate it with the 15,000 gallon existing tank, thereby creating a biodiesel tank capable of storing 22,000 gallons. 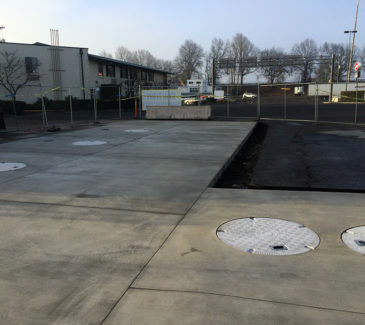 Crews installed two (2) biodiesel blending sumps, modified the bulk fuel loading rack piping to dispense biodiesel, and prepared for chemical injection of cleaning agents. AEC has also managed the installation for all related electrical. We then began Phase 2 by isolating the dispensers and saw cutting in order to remove them. Additionally, we broke up the concrete and asphalt over and around the existing tank. Crews excavated the piping trench from the blender sumps to dispensers 8-10 and exposed the turbine sumps and spill buckets. Next, we removed the old siphon system and installed new 3” siphon lines and related appurtenances. 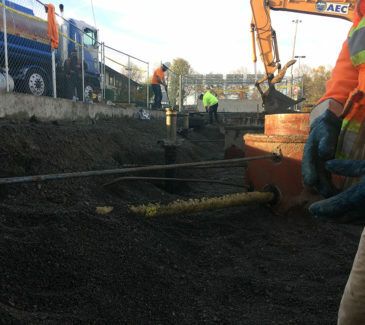 Additional piping work included the installation of new 3” steel line from one tank to the transition sump in order to maintain site operations. Crews installed new piping from the turbines to the blending sumps and installed new spill buckets and risers, before the installation of the new dispenser, their sumps, and island forms. AEC again managed the electrical installation and then backfilled and compacted the excavated areas, poured the new drive slabs and concrete islands. The dispensers were set, and start-up and purging activities were performed before the crews patched the asphalt and opened the new dispensers.